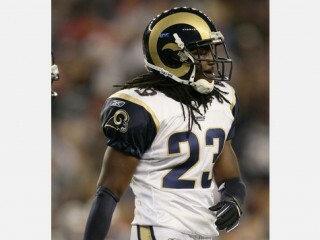 Jerome Murphy is an American football cornerback for the St. Louis Rams of NFL. He played college football at South Florida. He is considered one of the top cornerback prospects for the 2010 NFL Draft. Murphy was a productive two-year starter for the Bulls. He is a tall, lean secondary defender with deceptive strength. He is a tough hardnosed perimeter defender who lacks great quickness and speed to play out on an island in man coverages. Murphy is a physical corner who can jam and reroute receivers off the line of scrimmage and he's a solid run support defender. He is an instinctive player who leverages the ball well in coverage as well as maintaining proper body positioning defending the run. He can be inconsistent in block protection and wrapping up in the open field, but he is very aggressive for the cornerback position. Murphy is a good football player who has some limitations but should contribute as a rookie in a Cover 2 defensive scheme. Long with adequate bulk and fluid hips. Anticipates routes while dropping back in zone coverage and does a good job of tracking the play. Good leaper who high-points the ball. Fiery and aggressive defender who fills hard and likes to deliver shots. View the full website biography of Jerome Murphy.